Playing golf isn’t just an enjoyable outdoor pastime, but a game that has proved to benefit players’ health. Every area of your health – mental, physical, relational, spiritual, emotional and financial – can be refreshed, refocused and revitalized on the golf course. These six areas are all being stressed in our “do too much culture.” When you learn and enter into the “true spirit of golf,” then each shot is an exercise that leads to better health. Starting with the mental part of golf, a principle important to successful golf is “golf is a game of opposites.” The harder you try the worse you do. To reach your full potential, you must let go of what others think of your golf game, your hair, your body and your score. The resulting mental freedom will lead to better performance shot by shot adding up to lower scores and more social time. The physical compartment of the game is just as important as the mental. Brad Faxon, my college teammate and PGA Tour Champion, says you must “learn to love putting.” As you embrace golf and its success principals, the joy of the game turns to a real love and, plus, as you play more, you walk more, which has its own benefits. At the 93rd PGA Championship (on August 8­14, 2011), golfers walked 10,000 steps in one round. The Hospital for Special Surgery (HSS), distributed 25,000 pedometers and encouraged spectators to track their steps as they walked the course, as part of the “Let’s Move on Course!” initiative. During the championship, more than two million steps were taken, which is an average of 11,448 steps taken per person, per day. Even with crowds at tournaments, golf is still a quieter sport than most. To make the putt in front of your partners with the trophy on the line or the long drive over the water against the wind, golfers must quiet their minds and simplify their thoughts. This area relates to our spiritual lives. God the Father says, “Be still and know that I am God.” This peace we are looking for on and off the course enables us perform better in all areas of life. Also, to make that put, you have to know that your power lies in your hips and thighs. 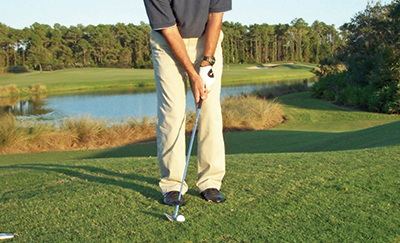 Leg and hip exercises are important for your swing because the power of the golf swing begins at the hips. Strong, stable hips and thighs help maintain posture and absorb forces from the upper body during the follow through, reducing the chances of injury. Stretching increases flexibility and reduces the risk of muscle/tendon injuries. Attend a Golf Mobility class at Palmetto Dunes Golf Academy and learn the five major power sources in golf. The emotional game of golf is different than the work place or any other sport. To be successful, you must understand the definition of the word “play.” It can mean to “act out the character of.” While some golfers act like a Parris Island Drill Sergeant, others act like a football player on the golf course. I came from a family of college football players. I had to unlearn this. Advanced golfers control their emotions. Live longer and play more golf!